With a balanced chakra system, you align your body to experience healing and full awareness of the world around you. Your 7 chakras when working harmoniously together can help uplift your energy and body. It is not uncommon to feel mental and emotional difficulties along with low self esteem if your chakras are not properly aligned. With a balanced chakra, you are able to live life more fully with little to no distractions mentally and even physically. When a charka is not in balance, it cannot manifest positive qualities in your life. An excessively deficient chakra can dominate your mind to create more imbalances in your life not allowing for your body to receive and absorb a better flow of energy. Are Your Chakras Balanced And Cleansed? You want to see right now if your chakras are properly balanced. The best way to find out is if you can tell that the majority of the time you aren’t living with the kind of energy you truly want. If you feel physical aches, pains, and overall emotional stress, then you know that your 7 chakras aren’t harmoniously aligned. How To To Start Cleansing The Chakra System. This step by step system is going to help you align your chakras the right way so you feel prepared and more experienced in life. Having a strong mind is not easy, and having a harmonious chakra only involves properly clearing the mind and getting yourself on the right path. The best way to open up your chakras and have all 7 align themselves together, you need to meditate. Sit upwards, close your eyes, and clear your mind. When you have a thought, redirect your mid to focusing on your breath. Deepak Chopra meditates daily for 2 hours in the morning. All you need, however, is 10-15 minutes to help you get started. A great technique to try is one used by Deepak’s personal Yoga trainer, Tara Stiles. One of Tara’s favorite forms of meditation is to sit upright comfortably while bringing your arms up in a V shape, almost like you are saying a big “thank you” to the heavens. Staying here for 3 minutes is a good start, but the practice originally lasts for 12 minutes. Doing this helps physically, mentally, emotionally, and it’ll help align all of your chakras. There are certain movements you could do daily to help with your chakras. 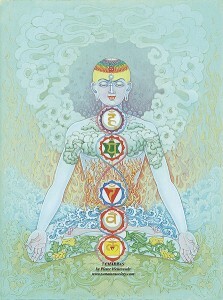 With 7 different chakras, each are connected to certain parts of the body. There are imbalances that are associated to every single chakra, and working on different parts of the body can benefit your chakras. For example, the third chakra is located in the solar plexus. This chakra is doing great if you have a healthy self esteem, a sense of belonging, respect, and appreciation. You are not balanced here if you have recurrent ulcers, indigestion, and abdominal stress. To heal it and keep it aligned, doing planks, abdominal exercises, and core exercises through stretching can help stabilize it. With many core poses in Yoga, they can all help with this second chakra. As another example, the third chakra’s imbalances involve having guilt, fear of pleasure, sexual addictions, and other problems. To get it balanced, doing abdominal exercises like the Cobra in Yoga and the bridge can help with the pelvis and heal this chakra. Join a local class, stretch every part of your body, and get all 7 chakras cleansed. The above are just two simply ways to help heal the majority of your chakras. When combined with Hatha Yoga, visualization, and more meditation daily in different forms, you’ll be able to change your life and improve your health. With 7 healthy and aligned chakras, expect to have an immense feeling of heaing overwhelm your life. Expect to have your body improve, your mind developed, and your overall life being flown with energy throwing you in the right direction in your life. This entry was posted in Meditation, Spirituality, Yoga and tagged Magic, Magick, Mantrik, meditation, Wicca, Witchcraft, Yoga by Guest Author. Bookmark the permalink.